Slowing growth overshadowed a strong year for IMAX's new theater business. Shares of giant theater company IMAX Corporation (NYSE:IMAX) fell 11.6% in 2016, according to data provided by S&P Global Market Intelligence, as slowing growth led to an investor sell-off. Let's start with the bad news: IMAX's growth slowed significantly in 2016, exemplified by third quarter growth of just 1.7% to $86.6 million. You can see below that second quarter growth was actually negative. Under this slowing growth scenario, it's not surprising investors weren't excited to bid up a stock trading at 52 times trailing earnings. The good news is that 162 new theaters were contracted in the third quarter and backlog stands at 547 theaters, up from 384 a year ago. Long-term, the expansion of theaters should help grow IMAX's revenue base if movies that exploit the format are created. While growth may have slowed in 2016, I think the future is getting brighter. Wanda signed a deal to add 150 theaters in China over the next six years, which will make China a key market for the company. Imax's business model is all about exploiting the existing theater infrastructure, and every new theater adds to the leverage in the business. 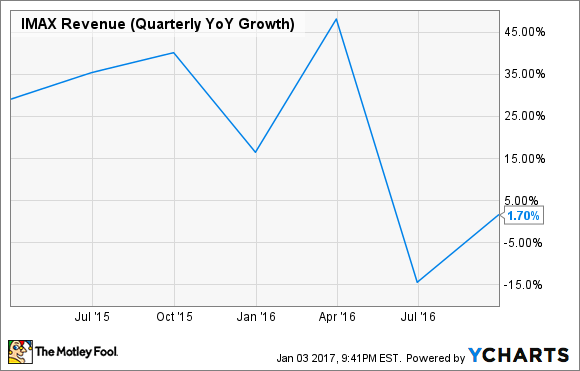 IMAX stock may have had a bad 2016, but this isn't a company I would give up on because of a few weak quarters.